Curt Liles first came to the MCC SBDC in March of 2012. He had operated a rider and safety school after leaving the military. He made the decision to relocate to Texas and through a friend in Tyler, he heard about the SBDC and worked for a semester as an intern at the Tyler SBDC while going to school there. After relocating to Waco, he decided to seek out the SBDC before forming his company in Texas. Curt came to the SBDC with an idea of training not only the general public, but also law enforcement agencies as well. He decided that he would be able to self-fund the project and needed assistance in creating a business plan and financials projections to help him accomplish his goal. Counselor Steve Surguy worked with Curt to outline his goals and budget to achieve this. He worked on demonstrating to Curt the steps in creating a positive cash flow and creating a marketing plan. Curt started the business with a 6 motorcycles and a trailer. Steve continued to work with Curt as he expanded his service area by providing target data on demographics, traffic patterns and other marketing tools. In May of 2012, Curt expanded to 8 motorcycles and is now holding classes in multiple locations. 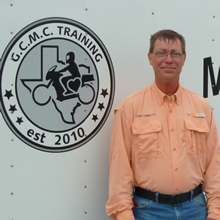 Curt continues to work with the SBDC and has also signed an agreement to teach a rider safety course in McLennan Community College’s Continuing Education Program this fall.